The Ilulissat Declaration, a document signed by the foreign ministers of the five Arctic coastal nations at a conference in Greenland in May, 2008, has been variously interpreted as a response to climate change in the Arctic, the initial agenda of a new Arctic ‘G-5’, an effort to block an Arctic treaty, a defense of the institutional status quo in the region, and a ‘shot across the bow’ of European politicians who have recently interested themselves in Arctic affairs. Even though the declaration is only seven paragraphs long, a careful reader can find elements that would seem to justify aspects of all these interpretations. This paper briefly examines the context and background of the declaration, and assesses its implications for future decisions regarding management and governance of the Arctic Ocean. Over the past several years, the visible retreat of the Arctic summer sea ice has raised the prospect of increased economic activity, including shipping, fishing, and oil and gas development in the Arctic Ocean. Over the same period, conflicts and controversies concerning national claims to territory in the Arctic, such as that between Canada and Denmark over Hans Island, and the planting of the Russian flag on the seabed at the North Pole, have fixed the attention of the media and political leaders on the unresolved sovereignty claims among the Arctic nations. With the media headlining a ‘race to the North Pole’ and the possibility of resource-based conflict, political leaders outside the region, including some leading European parliamentarians, began to call for new international rules to govern resource development in the region. 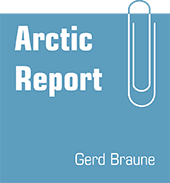 While some analysts assessed the need for new management arrangements based on the existing institutional and political framework in the Arctic, a number of NGOs and parliamentarians urged the need for an Arctic treaty modeled on the Antarctic Protocol, and the foreign ministers of the United Kingdom and Germany issued a statement calling for “…structures for the Arctic region…aimed at the cooperative and peaceful exploitation of resources and at preserving the ecological heritage of mankind.” (March 2008). In late 2007, Denmark, an Arctic coastal state by virtue of its sovereignty over Greenland, invited the four other Arctic coastal states (Norway, Russia, Canada, and the U.S.) to a conference with the stated intention of confirming the commitment of all the oastal states to an orderly process for the resolution of national claims in the Arctic. Although not explicit, the invitation was understood as a response to the controversy caused by Russia’s flag-planting excursion. However, when the Danish delegate to the Arctic Council announced Denmark’s intention at the November meeting of the SAOs (Senior Arctic Officials), the composition of the planned conference itself became a matter of controversy. The other three members of the Council -- Iceland, Sweden, and Finland -- were clearly concerned that the five coastal states (now known as the A-5) were undermining the role of the Council, and the six ‘permanent participants’, representing the indigenous peoples of the Arctic, objected to any conversation among Arctic governments that did not include them. Nonetheless, the conference was held, and after a day of sightseeing, the Ilulissat Declaration was issued May 28, 2008. Express their interest in strengthened cooperation in science and the exchange of research information. Reading from the comments made by the foreign ministers at the time and since, it seems clear that the A-5 intended to communicate some broader messages as well. Perhaps the most important is that the five coastal states are asserting a predominant role in addressing both territorial issues and also issues related to resource development in the Arctic Ocean. The declaration notes the ‘unique position’ which the coastal states enjoy to address the possibilities and challenges associated with issues of sovereignty, sovereign rights, and jurisdiction. Such a view obviously challenges the potential for either the non-coastal Arctic nations or non-Arctic governments to exert claims and interests in resources, or influence over their disposition. A second message is that the A-5 are committed to resolving territorial issues through the legal framework provided by UNCLOS. This is particularly significant in light of Russia’s flag venture, and of the fact that the U.S. has not yet ratified the convention. The A-5 also clearly hoped that their reaffirmation of UNCLOS would quell the perception that the Arctic had become a new ‘wild west’, a view articulated in an opinion piece in the New York Times by State Department Legal Advisor John Bellinger. What specific protective measures are envisioned is left largely unaddressed – the only specific example being a commitment by the A-5 to work together and with the International Maritime Organization (IMO) to strengthen safety measures for maritime navigation. However, the U.S. has recently expressed openness to the development of new regional fishery management agreements for the Arctic, and nothing in the declaration would bar such a move. The declaration is somewhat ambiguous on the question of how much latitude will be accorded to governments other than the A-5, or to non-governmental entities, who wish to influence the utilization of Arctic resources or the navigational use of the Arctic Ocean. At several points, it notes a role for “interested parties”, but it avoids recognizing such interests with any specificity, never mentioning, for instance, the EU, European governments, observer states to the Arctic Council, indigenous peoples’ organizations, or NGOs. Although the Ilulissat Declaration is primarily a defensive document, it does not rule out new management arrangements in the Arctic. In fact, it starts with a recognition of the impending change to the Arctic associated with global warming, and makes clear that the need for strengthened management efforts in certain areas is accepted by the five Arctic coastal states. However, its central message is a pre-emptive one, designed to deter efforts by non-Arctic nations to interest themselves in a domain which is conceived to be primarily the affair of the A-5. In fact, the declaration implicitly recognizes that the success of the A-5 in defending a predominant role in the Arctic over the long-term will depend to a great extent on the efficacy with which they address the concerns of a broader international community regarding the management of the Arctic Ocean and the protection of Arctic marine resources.